Culturally authentic, all-natural facial, bath, body and hair care remedies made with certified organic and fair trade ingredients. 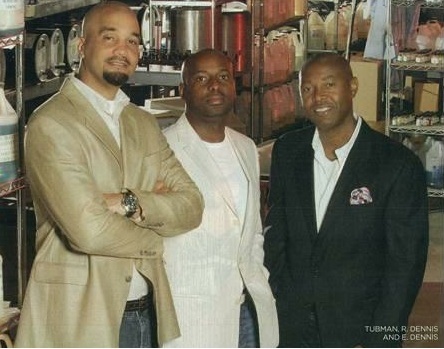 A mixture of tenacity, determination and perseverance helped two childhood friends, Richelieu Dennis and Nyema Tubman, turn adversity into a highly successful and unique business. Richelieu and Nyema were born in Liberia, but fled civil war after most of their families’ possessions were destroyed. They both immigrated to the United States, but the situation was not much brighter, as they suddenly found themselves without resources or employment. Remembering his roots and deep family tradition, Richelieu realized his vision was to offer culturally authentic, high-quality skin care products for underserved communities. In 1992, Richelieu and Nyema began to sell their shea butter soaps that had been passed down to them by family through the generations along the sidewalks of Harlem. Their routine was to make the soaps and shea butters in the wee hours of each morning, load them up into a rickety van, set up the products on tables on the street at sunrise, and sell until the sun went down. By the second year, their hard work came to fruition when they formed Sundial Creations and Nubian Heritage, with Richelieu acting as Founder and CEO, and Nyema, as President and COO. The company has grown and bloomed, and now Nubian Heritage products are sold all over the world. We are proud to carry on their legacy for over 15 years. Check out the body wash and lotions we carry below. Nubian Heritage "African Black Soap with Oats, Aloe Vera & Vitamin E Lotion"
Nubian Heritage "African Black Soap with Oats, Aloe Vera & Vitamin E Body Wash"
Nubian Heritage "Coconut & Papaya with Vanilla Bean Extract Body Wash"
Nubian Heritage "Coconut & Papaya with Vanilla Bean Extract Lotion"
Nubian Heritage "Goat's Milk & Chai with Rose Extract Body Wash"
Nubian Heritage "Goats Milk & Chai with Rose Extract Lotion"
Nubian heritage "Honey & Black Seed Body Wash with Apricot Oil "